Most every big Networking company has announced something related to SDN. Whether simple marketing to concrete legit solutions, its a question of time until the market is filled with SDN-related products. It is thus essential to start getting familiar with it, and you know damn well there’s nothing like getting your hands dirty. So here are some helper-notes on getting started with sandboxing OpenFlow (OF) environments. To do so I’m using Mininet – a VM created part of an OpenSource Project to emulate a whole complete environment with a Switch, an OF Controller, and even three linux hosts. Also note I’m using my desktop as a Host, with VirtualBox. If you don’t have it yet, download VirtualBox, or another PC hyper-visor Software such as VMware Player. VirtualBox has the advantage of being free for Windows, Linux and Mac. Download Mininet VM OVF image. After decompressing the image, import the OVF. 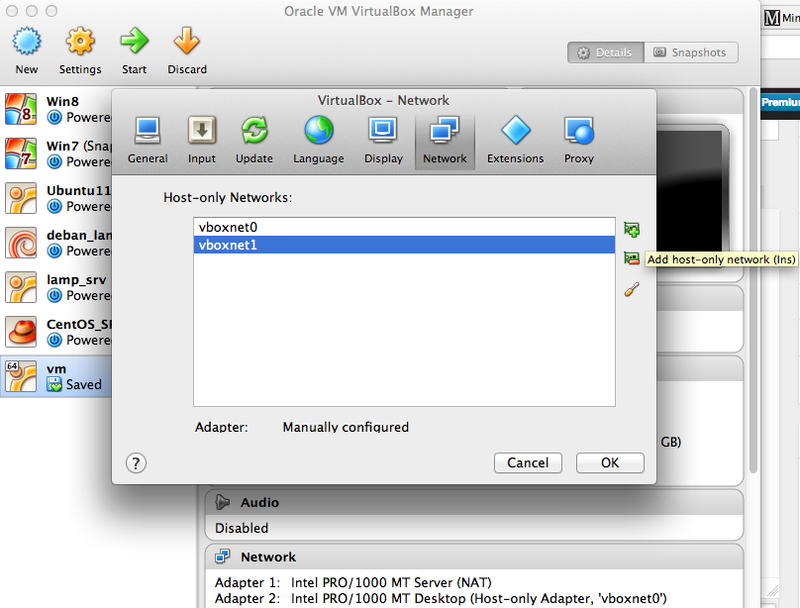 In order to establish terminal session to your VM, you’ll need to add a Host-only Adaptor on the Mininet VM. So first (before adding the adaptor on the VM itself) go to VirtualBox > Preferences. Then select the Networking tab, and add and adaptor. Next edit Vm Settings, and add an Host-only Adaptor. Save it and boot the VM. Type sudo dhclient eth1 (or if you haven’t added another adaptor and simply changed the default Adaptor from NAT to Host-only adaptor then type eth0 instead of eth1) to enable DHCP service on that interface. Type ifconfig eth1 to get the IP address of the adaptor. Mininet has its own basics tutorial – the Walkthrough. Also interesting is the OpenFlow tutorial. Type sudo mn –topo single,3 –mac –switch ovsk –controller remote. This will fire up the emulated environment of the switch, OF controller, and 3 linux hosts. This should already get you started. Previous Post Software Defined Storage – marketing boloney or technical Breakthrough?